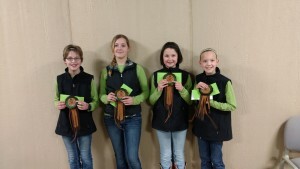 Elle Harris, Zoe Harris, Selah Harris & Bailey Fairbanks competed in Horse Quiz Bowl, and placed as the reserve champion team. They have been coached by MJ Waters. Individual team members also competed with their own scores throughout all of the rounds of Horsebowl. Zoe Harris tied for first with her individual points for the Quiz Bowl Competition. The second day of the Horse Expo consisted of Horse Judging and Hippology. The 4-H’ers had a great variety of classes to judge, including Belgian Halter, Pony Halter, Performance Horse Halter, and a performance event; Ranch Riding. In Horse Judging, Tripp County had two individuals place. Bailey Fairbanks placed 1st and Selah Harris placed 3rd, both in the beginner level. The Hippology Contest consists of a series of stations set up to test the youth’s individual knowledge of various Equine topics. Among other topics, members had to identify equipment, breed characteristics, breed association rules and origins, coat colors and anatomy. Elle Harris placed 2nd individually in the Junior Hippology contest.